The Sports World In The Eyes Of A "Philly Fan". 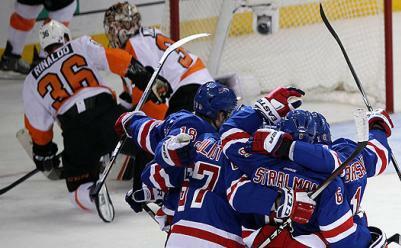 The roller coaster ride that was the 2013-14 Philadelphia Flyers season has come to an end following a 2-1 loss in Game 7 of the Eastern Conference Quarterfinals to the New York Rangers. The issues that plagued them throughout the season wound up costing them their season in the end, plain and simple. They couldn’t get over their habit of taking themselves out of the game before they had a chance to get into it and handed the game, and the series, to the Rangers in the second period after coming out attacking in the first. The Rangers, to their credit, took advantage of that and are on their way to the second round. Which brings us to another season with no Stanley Cup and a disappointing end. Listen, I want a Stanley Cup in Philadelphia just as much as the next person, if not more. The problem is the Flyers are going about it all wrong. One of the first things that the Flyers need to evaluate is, not their roster, but those who put that roster together. Obviously Ed Snider is not going anywhere, but his stubbornness and denial that the Flyers are not in a great spot is not helping. 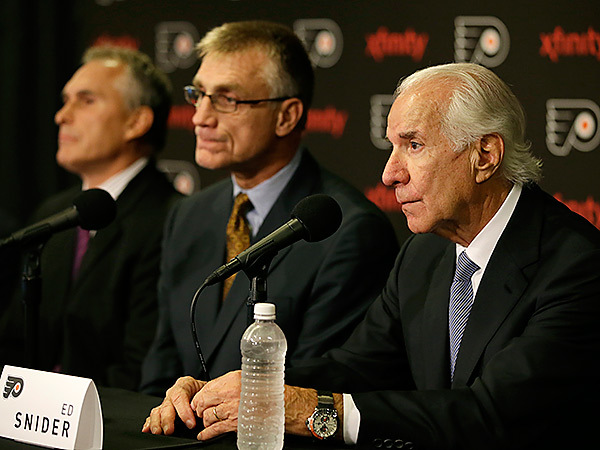 Also, my patience is really running out with Flyers GM Paul Holmgren. He was not the first to do this, but the last few years have been filled with overpaying for players that are either nearing or past their prime, and don’t pan out when they are in Philadelphia. Not to mention, his constant attempts to better the Flyers defense have not been working the way fans had hoped. The Flyers have good young talent on their team, but they also have players that are on the opposite end of the spectrum as well. What’s worse is that quite a few of the older players have big expensive long-term contracts that tend to leave the Flyers straddling the salary cap. Bottom line is that this whole spend big on older established talent as opposed to younger upcoming players is not working and needs to change. The defense in particular showed their age all throughout this season, and in the playoffs as well. The turnovers, lack of speed and some poor decision making are going to leave the Flyers in mediocrity for year to come if it does not change. If that doesn’t change, then it’s time to change who makes those decisions. And yes, I am talking about Paul Holmgren. What also needs to change is Ed Snider, though that’s much easier said than done. As I mentioned earlier, his stubbornness and reluctance to adapt to today’s NHL is really hurting the team. The Flyers don’t have to completely abandon the “Broad Street Bullies” style of play, but they do need to adapt to the new faster NHL. Ed Snider is going to have to realize that sooner rather than later if he wants another Stanley Cup any time soon, which he certainly does. I’m not saying he has to be gone from the Flyers, but just tweaking his way of thinking will go a long way. Perhaps one of the biggest piece of the puzzle moving forward is goaltender Steve Mason. Fortunately, for all the Flyers have done wrong, they have also done some things right. For example, there were some young faces who spent time with the Phantoms in the AHL and with the Flyers in the NHL who gained valuable experience this season. Also, by signing Steve Mason to a 3-year contract extension, they have some stability in goal, which allows them to focus on other areas in need of improvement, namely the defense. My hope for next season is to see more younger players and less older, slower players who take up cap space. The future looks bright for this team, but there are still major changes that need to be made. Until then, it’s time to shave my playoff beard and get ready for another early start to the off-season. Here’s to better years ahead.